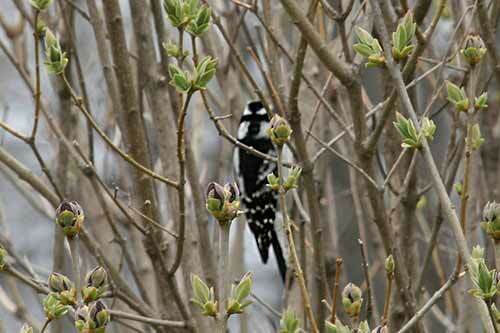 During the Winter and Spring birds have come in large numbers this year. The word has gotten around. I think the birdie grapevine is working and I'm getting more birds coming to the feeders. I use binoculars, 7x35. I have many different pairs but these are the easiest to use because I can actually follow the birds as they fly. I have a page on binoculars if you need some info. The starlings have discovered a liking for my suet/peanut butter/dried fruit mixture. 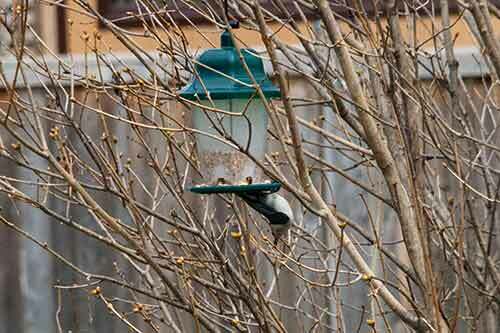 I made a second feeder that is harder for them to perch on and the woodpecker have adopted this second one. The woodpeckers are better at attaching themselves to the hanging wood. 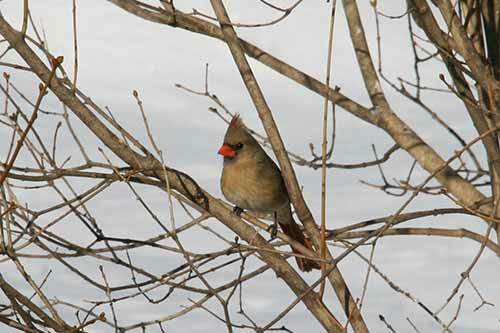 Every day I get small flocks of cardinals. There are more than in summer when I rarely get more than a pair at a time. 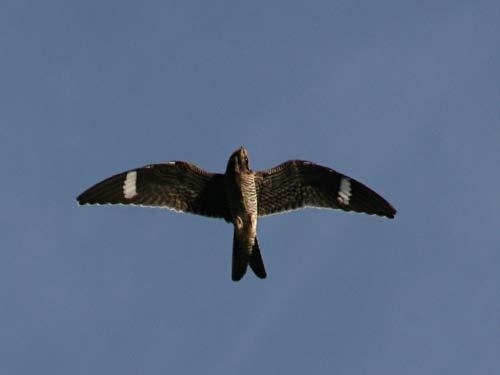 The little hawk is a common sight. I know he's around when all the birds disappear. This winter I had a short shanked hawk and a Cooper's hawk. The crows make a career of chasing the red tailed hawk away but he's still around, I'll get a photo some day when I'm lucky. I got a large flock of mixed blackbirds for a short while. 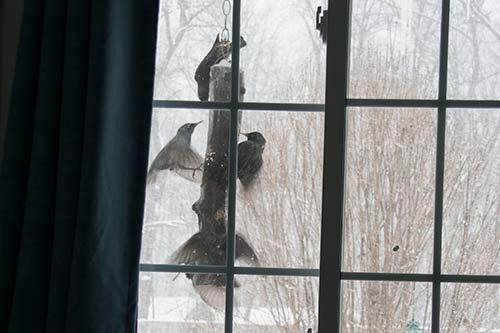 Dozens of birds would descend on the feeders and make a huge fuss. They are mostly gone now except for a few birds. 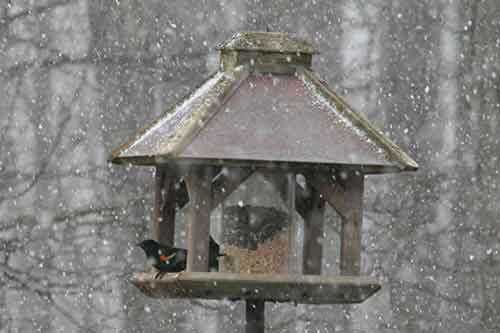 The red winged blackbirds have stayed and a few come every day. 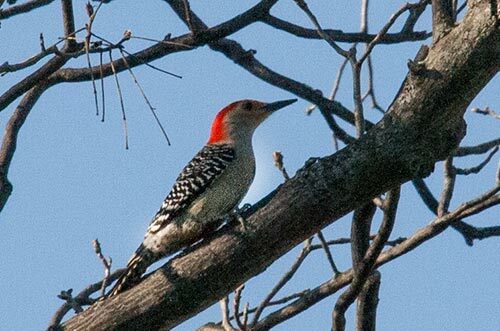 The red bellied woodpecker is a regular too. He has a long beak and is very good at picking at the suet and getting goodies out. Mr and Mrs Downey woodpecker are here everyday. I have several pairs I think. 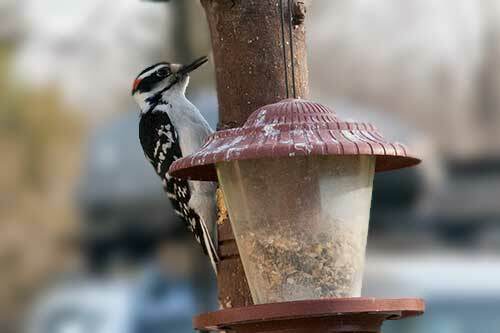 They look a lot like the hairy woodpecker which are larger. I also have several of those visiting every day. Two very timid birds have started coming. A White Breasted Nuthatch and a White Crowned Sparrow. The Nuthatch zips onto the suet/peanut butter feeder, grabs a mouthful and flies off. I barely see him because he is so fast. 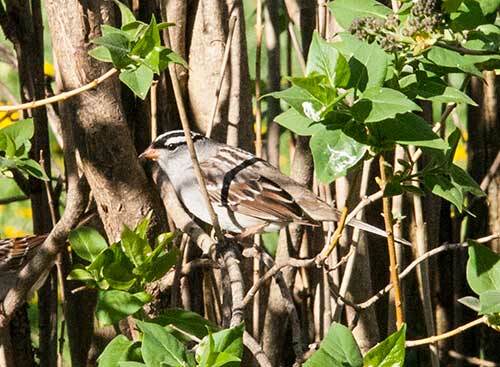 The little sparrows dart around on the branches and jump to the ground then are gone. They might tame a bit more as the weeks go on. 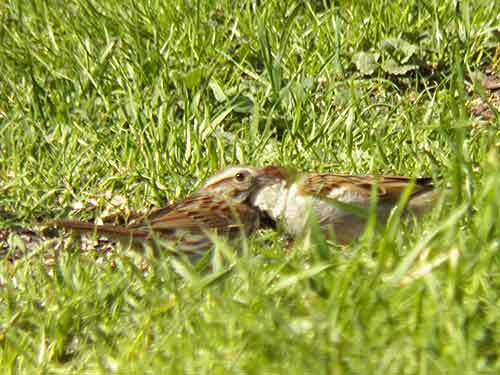 Two little birds smooching in the grass. There are wild displays everywhere. 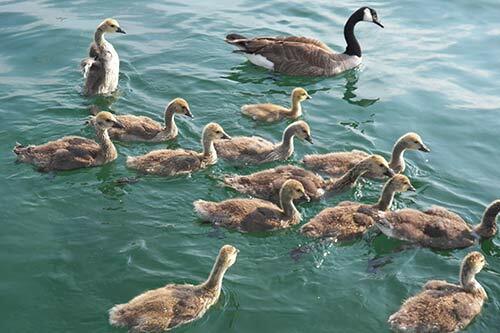 Canada Geese and her goslings have almost reached the ugly stage. I think that photo is actually from last spring. Several mothers would go out together and all the kids would be together with the moms patrolling around. The smallest and the largest bird I get are visiting together. I have been discovered by lots of hummingbirds this year. The turkey was a great surprise. 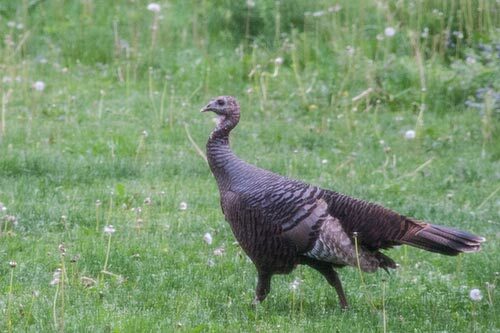 He came out of the woods and started eating the seeds under the hanging feeders. He's been coming every day. Yesterday I also had a rabbit at the same time as the hummingbird and the turkey. 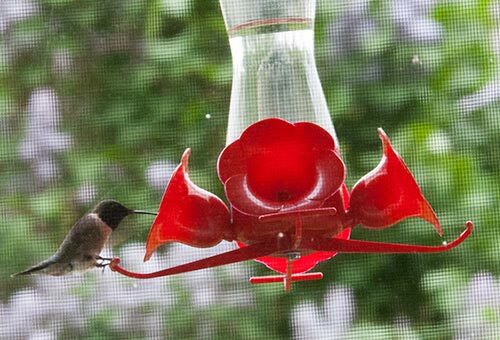 Humming birds are doing a strange thing this week. They fly back and forth like they were on a pendulum. Presumably it's courtship behaviour. I couldn't see her but he was doing a lot of displaying. The guy has a patch of red on his neck. 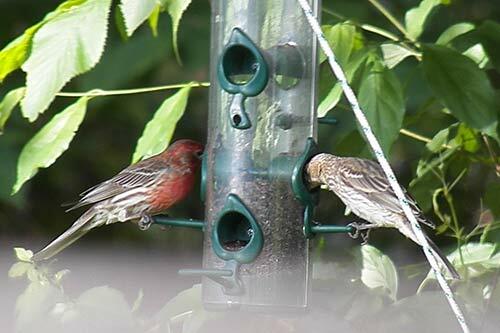 House finches come and quietly eat at the back feeder. I had a whole flock of the little raptors. I haven't figured out what they are yet. They are about the size of a small seagull. MORE BIRDS HERE: My first season. I mainly use a couple of field guides: The Audubon Society Field Guide To North American Birds: Eastern Region It has photographs of the birds, usually male and female and is small enough to carry around in your pack. The second book is the Birds of North America: A Guide To Field Identification (Golden Field Guide f/St. Martin's Press) It has drawings instead of photos. The drawings are useful because it is sometimes easier to see an idealized view of the birds showing all the characteristics that might not be seen in a photograph. I have not had much luck with birdfeeders that were enclosed in large mesh to keep big birds out. My small birds don't seem to like the idea of having to go into the meshed area.